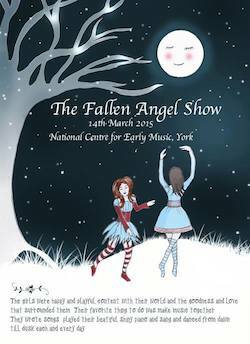 Come and see our full length ‘Fallen Angel Show’. Come with us into a dreamlike world where songs, peppered with puppetry, dance and narration reach into 21st century realities in an unreal, wonder-tale style. With sister piano duets at the fore as always, there’ll also be our full 7 piece band, twists of cabaret, classical music influences and hints of the dark wackiness of Tim Burton. Promising to be an other-wordly experience, the show explores the depth and creativity of human spirit to overcome adversity and the uplifting power of music.